A sealed class cannot be a base class and it prevents derivation. Child class cannot inherit sealed class. A sealed class can be defined by putting sealed keyword before the class name. If you uncomment child class, it will raise compile time error. In this chapter you learned how to use Sealed class to hide base class from child. Sealed keyword locks the class so it is hidden from child class. 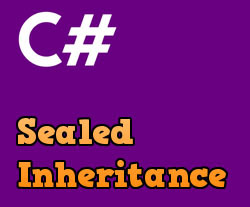 In the next chapter you will learn  Inheritance by programming examples.